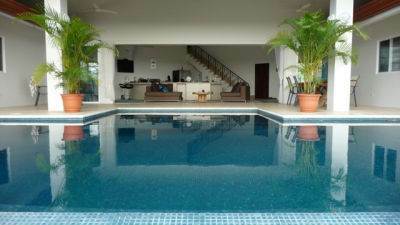 Fully furnished home with hill top unobstructed ocean and mountain views, just a five minute drive to Venus beach in San Juanillo, a pristine white sand beach, one of most beautiful secluded un-touristy spots in Costa Rica. The house is located inside a secure 300+ acre nature preserve with clear year round river running through the preserve. It is also located close to some of the best surfing beaches in Costa Rica, including Playa Ostional, Marbella, Pelada, Guiones and Playa Negra. Finca Los Sueños residential community has the legal status of Natural Reserve, granted and registered by the Costa Rican goverment. The Nature Reserve is not recorded on individual FLS lots. It is a community asset that is owned and protected, in perpetuity, by the FLSOA S. A. in a legal Costa Rican Trust. House features a infinity pool overlooking the ocean, a large master suite with a king size bed, walk in closet, large bathroom, and direct staircase to roof top for an immaculate 360 view. Two additional bedrooms each with a queen size bed, private bathroom, split unit A/C w/remote control in each of the three bedrooms. Kitchen is spacious, overlooking the infinity pool and the ocean and is integrated with the great room. It has stainless steel appliances and fully stocked kitchen utensils, dishes, and everything you need to cook and serve a meal. House has a secure storage room (bodega), double car garage, washer & dryer, Sky Sat TV, High Speed Wi-Fi internet, security system, and 12 variable speed fans inside and outside. The closest airports are in Nosara, 30 minutes south and Tamarindo, 40 minutes North. The closest international airport is in Liberia, 90 minutes North.